Furnace Installation in Pittsburgh | Schultheis Bros.
For over 70 years, the Schultheis Brothers Co. has been offering furnace installation in Pittsburgh along with other heating & cooling services. At Schultheis Bros., we are committed to our customers and that has been our philosophy since day one. 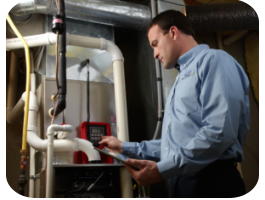 We strive to provide the best furnace installation there is while maintaining a high level of professionalism and integrity with our customers. We only utilize and recommend certified equipment of the highest quality and we offer a wide variety of furnaces to choose from so you won’t be stuck in the cold all winter. Additionally, we have an A+ rating with the Better Business Bureau and provide 24 hour live customer support, so if your furnace fails, we’ll be there to help. If you would like more information about furnace installation in Pittsburgh or if you have any questions about our other services such as roofing and plumbing, call us today at 412-793-8000. You can also fill out the contact form located on this page and one of our associates will get back to you as soon as possible. The technicians here at Schultheis Bros. have advanced training and the experience to service all makes and models of furnaces. Our service area covers a large area around the Pittsburgh and Greensburg towns, so your home is never too far away. We offer a variety of furnaces that can fit your budget and our trained comfort consultants can help you through the entire installation process, whether it is for replacing an existing furnace or converting your home’s air system. Our consultants will be able to guide you in regards to choosing the equipment that best serves your home and can work on your preferred brand. We are always working to refine our methods to help save you money and we also have financing options available on furnaces for those with approved credit. Learn more about it on our Payment Options page. If you have any questions or would like more information on our furnace installation services in Pittsburgh, call us today at 412-793-8000. Or fill out the contact form on this page and we will respond shortly.